Lorrie Fink paints with oils, depicting native and invasive plants she's encountered in wilderness areas, in vacant lots, and on the edges of her back yard. Through color and gesture, she conveys the exuberance of things that grow wildly without invitation or cultivation. Located in the midst of her garden, Lorrie's studio offers a front row seat to cycles of growth and decline. Lorrie's recent work, the Corn Lily/Out Loud series, moves toward abstracted interpretations of botanical forms, working from digital studies to create pattern and tone. These paintings suggest aerial views, biomorphic forms, geologic patterns, movement. Corn lilies are native perennials found in the Eastern Sierras and other western regions. 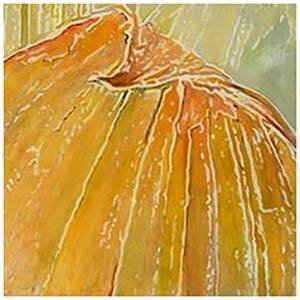 Painting them allows her to coalesce her love for color, paint and the natural world. Lorrie Fink lives and works in Oakland. Her work has been part of group and solo shows both nationally and around the Bay Area. Sonia Gill loves to arrange things and to transform things. Using the flowers, fruit, and trees in her orchard in Mendocino County, she creates compositions through photography. She refines her compositions until the perfect balance of lights and darks and shapes is found. A small percentage of these photo compositions become paintings. She starts all over again when she interprets the composition in paint. The combinations of infinite varieties of perspectives enhanced by multiple light sources that Sonia experiences in her half-acre orchard allow us the ability to find a deep level of meditative consciousness. Putting color and values together in paint, in the interpretation of her photographs, allows Sonia to create a stronger, clearer, and more vibrant statement about the world as she experiences it. She says that "these visual poems conduct a current through me, a frisson: the jolt comes from the use of real life imagery, in real time, to create a timeless moment that could be a fantasy." Her work captures a moment in time yet last forever and her compositions can be grasped in a glance yet be so compelling that there is always something new to see. 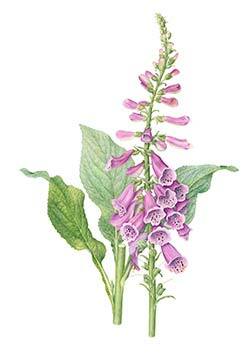 Lee McCaffree is a botanical illustrator in watercolor. Much of her work concentrates on native plants which she hopes will increase their visibility and use in public and private landscaping. 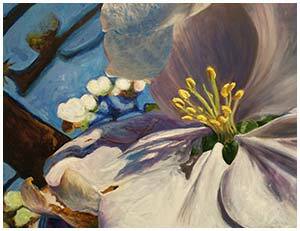 Her skill as a botanical artist allows her to focus her creativity on the finest details of each plant she paints. Lee began her career as a botanical artist in London, England studying under Christabel King of Kew Gardens. She received Medals for showing her “Pinus” series and “Plants in Peril” series at the Royal Horticultural Society exhibitions in London. 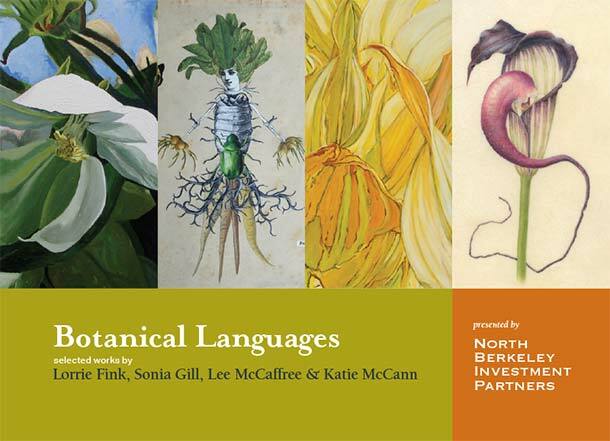 Her works are in the permanent collections of the Royal Botanic Gardens at Kew Collection, London, the Filoli Florilegium and Hunt Institute of Botanical Documentation and private collections. She has also exhibited at botanical gardens and other venues throughout the United States. In addition to creating botanical art, Lee is a primary instructor and co-coordinator of the Botanical Certificate Program at Filoli Estate in San Mateo, CA. She also teaches privately and at UC Berkeley’s Botanical Garden. She resides in Orinda, California. Katie McCann creates hand cut collages of strange creatures and plants which are part science fiction and part faerie story. She is fascinated by animals that visually resemble plants and her recent Zoophyte (Plant-Animal) series brings these botanical beasties to life in the form of intricately cut and pieced together collages. Katies cuts out and cuts up the illustrations from a vast collection of old zoological, anatomical and natural history books and transforms them into paper hybrids. She pieces together different elements such as feathers, flowers, shells and bones so the collages evolve like a complex jigsaw puzzle. By using the foxed and torn end pages of the books as surfaces for her collages, she is able to present her Zoophytes as discoveries and specimens from a by gone age. 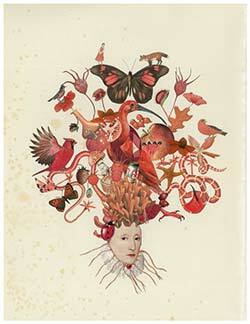 Katie McCann is an English collage artist currently living and working in Berkeley, California. Her work has been exhibited across the USA and in Europe.